30 MMS January 2017 mmsonline.com RAPID TRAVERSE Machining Technology in Brief With 3D printing, the range of design options for th e s e s p e c i a l to o l s i n c re a s e s, a n d u n u s u a l designs specified by special-order customers can move into production practically as soon as they are modeled. It will take more additive manufacturing capac- ity to fully realize the promise of the capability for special orders, he says. The company is explor- ing how far to advance with this means of produc- tion, and how quickly. As yet, there is 3D printing Komet of America, call 800-656-6381 or visit komet.com. Thread Mill Without a Pilot Hole BY D E R E K KO R N S uccessful job shops tend to be the most flexible, adaptive and responsive of machining businesses. There's no gua ra nte e a ny one job will re pe at, so the se companies must set themselves up to process a w i d e v a r i e t y o f w o r k i n a n e f f i c i e n t a n d timely manner. 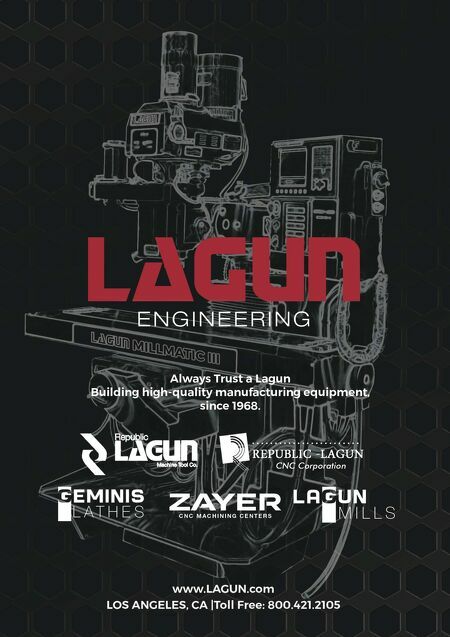 This means thoughtful decisions must be made about what type of equipment they will use to quickly turn a variety of jobs, often in small batch sizes, for their customers. For example, some shops try to standardize on the types of cutters they use and keep loaded in a machine's automatic toolchanger (ATC) magazine. That way, setups c a n b e f a s te r, b e c a u s e fewe r to o l s h ave to be added and measured/touched-off for each new job. Therein lies the value of a thread-milling tool. 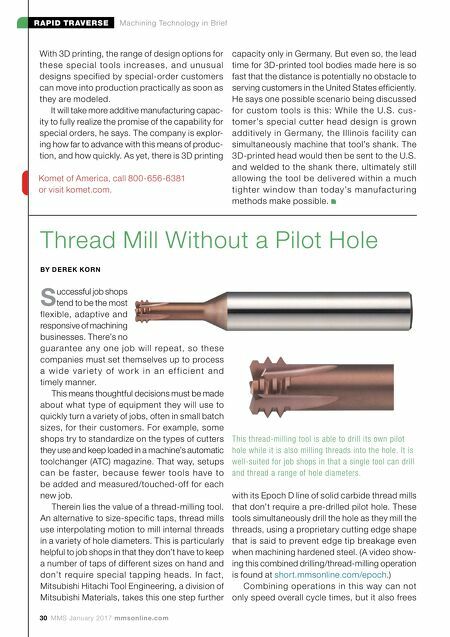 An alternative to size-specific taps, thread mills use interpolating motion to mill internal threads in a variety of hole diameters. This is particularly helpful to job shops in that they don't have to keep a number of taps of different sizes on hand and don't require special tapping heads. In fact, Mitsubishi Hitachi Tool Engineering, a division of Mitsubishi Materials, takes this one step further with its Epoch D line of solid carbide thread mills that don't require a pre-drilled pilot hole. These tools simultaneously drill the hole as they mill the threads, using a proprietary cutting edge shape that is said to prevent edge tip breakage even when machining hardened steel. (A video show- ing this combined drilling/thread-milling operation is found at short.mmsonline.com/epoch .) Combining operations in this way can not only speed overall cycle times, but it also frees This thread-milling tool is able to drill its own pilot hole while it is also milling threads into the hole. It is well-suited for job shops in that a single tool can drill and thread a range of hole diameters. capacity only in Germany. But even so, the lead time for 3D-printed tool bodies made here is so fast that the distance is potentially no obstacle to serving customers in the United States efficiently. He says one possible scenario being discussed for custom tools is this: W hile the U.S. cus- tomer's special cut ter head design is grown additively in Germany, the Illinois facilit y can simultaneously machine that tool's shank. The 3D-printed head would then be sent to the U.S. and welded to the shank there, ultimately still allowing the tool be delivered within a much ti g hte r w i n d ow th a n to d ay's m a n u f a c tu r i n g methods make possible.